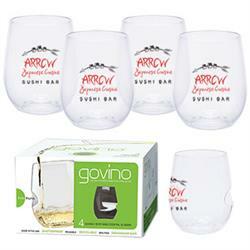 A gift pack of Govino wine glasses with your custom logo. The award-winning Govino cocktail/wine "glass" is actually not glass at all. It is made from a food-safe, BPA-free polymer, which reflects a wine’s color and projects its aromatics much like crystal. 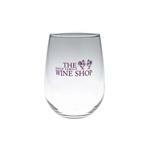 These Govino glasses are eco friendly as they are reusable and are dishwasher safe! 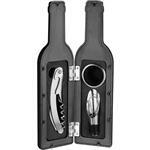 This revolutionary vessel designed for the ultimate enjoyment of fine wine actually works well for any cold beverage. The unique ergonomic thumb-notcAh is great for easy holding and wine swirling! These shatterproof "glasses" are as at home at a picnic or party as they are poolside, polo club, or port-side. 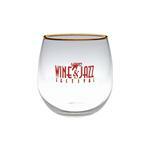 A Great Winery Promotional Item. Production Times Available: 8 working days. 3 day rush production available - call for pricing. Price includes a one-color, one-position imprint. Additional Colors/Positions: Add $1.00 each. All Govino orders must be imprinted-no blanks permissible. All Govino orders must be imprinted-no blanks permissible.